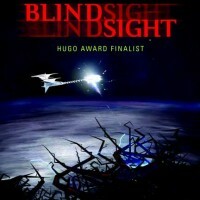 Blindsight might be one of the most superb books I’ve ever read at this type of story telling. In part because every aspect of this book is infused with it, from the nature of the characters themselves, to the dialog, to the plot. Whether you want your philosophy just beneath the surface or knocking you over the head, this book will deliver…as long as you want both. On the surface Blindsight is your classic first contact story, with a special team sent to the edge of the solar system to make contact with an alien intelligence. But in this not to distant future humanity has modified itself to the point where none of the characters involved are recognizably human. While this might not be the newest plot device ever, it’s not in the realm of physical differences that sets these characters apart, but in mental differences. In the nature of their consciousness. The crew is made up of a linguist with surgically induced multiple personality disorder, a biologist so biologically altered that he can see x-rays and taste ultrasound, a pacifist warrior, and a narrator with half his brain removed and replaced by machinery, lacking in empathy but able to model the behavior and thoughts of others, and all of them led by a genetically reconstructed vampire. And it is when they finally make contact with the aliens, who, paradoxically, may be intelligent but not sentient, and who further, are not particularly happy to see them, that the story really grabs you by the balls (or whatever you prefer to be grabbed by). Watts was seamlessly able to mix action, terror, and philosophy into one engaging narrative. Something I didn’t think could be easily done. Consciousness almost seems like a bad adaptive trait. It almost gets in the way sometimes. Limits our focus. Why do we have a brain that can store so much data, but this consciousness that has a limit of the awareness of that data. If any of these questions interest you, and you enjoy science fiction, and don’t mind a bit of a darker bend to you reading material, do yourself a favor and check out this book. Also, kudos to Watts for including a notes and references section (in a fiction book!) explaining all the legitimate scientific sources the ideas in the book were taken from. I finally reread it this year. Just as good as I remembered. I think it’s my favourite book. I’d really like to reread it when I get a chance, which may not be for a while. But I can definitely see it solidifying a place among my favorite novels. Thanks again for the recommendation! wow greg, i’ve been working on a video where i talk about my favorite sci fi books, and this was high up there. great book! Let me know when that video goes up. I’d love to see what you have to say, and what other books are on that list.